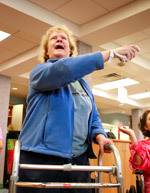 The Lake Taylor Transitional Care Hospital’s team of physical therapists, occupational therapists and speech language pathologists took Nintendo Wii, a video gaming system designed for the active teenage population, and introduced it to adult patients undergoing physical rehabilitation at Lake Taylor during the summer of 2007. This was prior to any national recognition of the Nintendo Wii being employed in adult rehabilitation therapy. The Nintendo Wii video game system includes five sports: baseball, bowling, boxing, golf and tennis, and costs $250 (retail). When using the Nintendo Wii in their rehabilitation, patients work on goals such as maintaining proper weight bearing, increased strength, endurance, balance, fine and gross motor skills, along with problem solving. Wii activity seems to enhance their long- and short-term memory, as well as daily living skills. Patients reported to the hospital team that they enjoyed an added bonus of an increased “cool-factor” in the eyes of their children and grandchildren. Ninety percent of the patients had never touched a video game system prior to Wii therapy, and they reported being proud and happy to feel like a kid at heart again. In recognition of Lake Taylor’s innovative research and programs, Old Dominion University presented Lake Taylor’s rehab department with a plaque as well as $1500.